It sounds whack, but a new scientific study suggests that people who eat chocolate regularly tend to be thinner. Sadly, that doesn't quite mean that you can run out and stuff your face full of candy all day to keep your weight down—but it does mean you probably should be eating some chocolate regularly. The study of nearly 1,000 US people, conducted by the University of California at San Diego, analyzed diet, calorie intake and BMI. It found that those who ate chocolate a few times a week were slimmer than those who ate it less frequently. Why? The researchers suggest that, despite containing so many calories, chocolate contains compounds that favor weight loss. The link even remained when other factors—including exercise—were accounted for. "Our findings appear to add to a body of information suggesting that the composition of calories, not just the number of them, matters for determining their ultimate impact on weight." 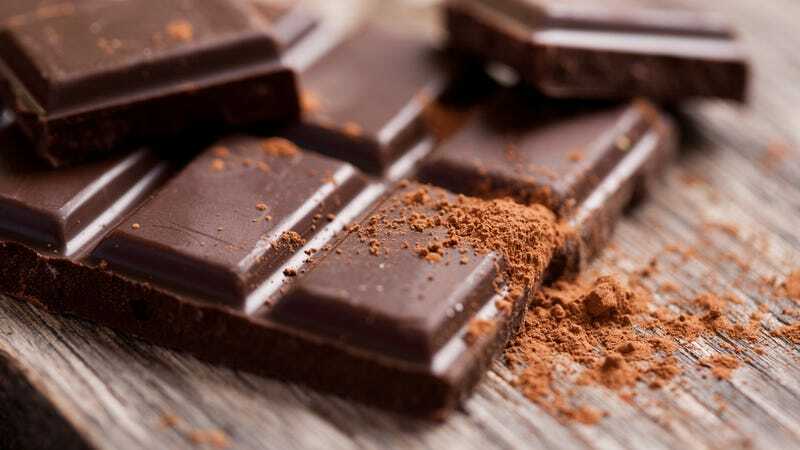 The researchers suggest that the compounds in chocolate that are associated with lower BMI are antioxidants called catechins, which improve lean muscle mass and reduce weight.